One of the most intriguing differences between Magic and Kaijudo comes in the realm of combat. Magic’s combat is wave-based. To attack, you send your army screaming and charging en masse, presenting a puzzle for your opponent who then has to determine if/how to allocate their defensive options. Barring a Relentless Assault-type effect, you have one shot at it then you’re done. Other games like World of Warcraft and Kaijudo tend to simulate a more individually driven approach. Your attackers each get their moment to impact the flow of the game. As we’ll see today with Razorkinder’s deck, that opens up a whole new swath of design space. 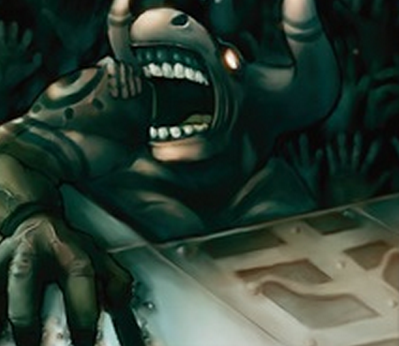 In reviewing Tatsurion’s deck, we were struck with just how aggressively-minded it was. For a Magic deck to be considered ‘aggressive,’ it typically needs to have a lower average mana cost to let it deploy a swarm of cheap options, backing it up with some amount of removal. 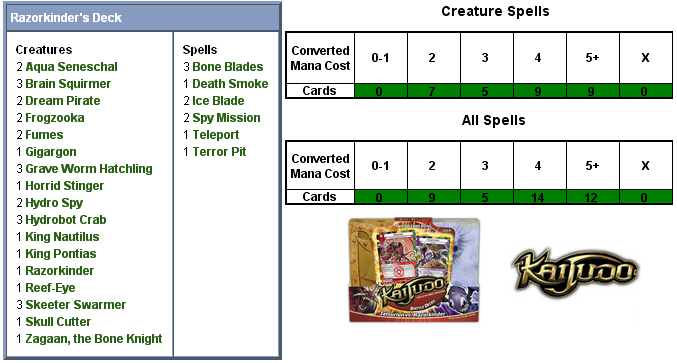 Although that option is certainly available in Kaijudo, the combat structure allows for a more nuanced expression with regards to attacking and blocking, since blocking is not a default option available to any creature but instead a keyworded ability. Imagine if the only creatures in Magic that could block for you were ones with defender, and you begin to get a feel for the considerations that Kaijudo deckbuilding necessitates. Tatsurion’s deck had no blocking options whatsoever- if you couldn’t outrace your opponent, then you lost. As we’ll see, this sort of headlong blunt aggression isn’t Razorkinder’s style. Instead, the “evil Puppet of Miasma Pit” prefers to be a bit more… controlling. Like a traditional Magic control deck, Razorkinder follows a very familiar archetype: lay down obstructions, use the time to pull ahead on card advantage, and finish with a closer. Towards that end, just over a quarter of the deck’s creatures have the blocker ability, letting you have a greater say in dictating the outcomes of combat. To begin with, you get a full trio of Skeeter Swarmers, an absolute steal at 4000 for only two mana. The downside is, they’re good but once. If they block something of equal size or larger, they die (of course), and if they block something smaller then their angry swarm drawback kicks in and they die anyway. Ahh, the price of power! You also get a Reef-Eye, which is a full 1000 smaller than the Swarmer, but can live to fight another day. Moving up to the three-drops, we find a pair of Dream Pirates. The Dream Pirates are blockers with an interesting twist, for they don’t possess the guard keyword like all your other blockers do (guard being the Kaijudo equivalent of defender). Instead, the ghostly ability lets your Pirate be available in a pinch for attack duty, though you’ll want to be careful if/when you use it. The Pirate is good for a single attack, after which it too fades away. The biggest blocker at your disposal, then, is the final blocker in the deck- the mighty Frogzooka. As you’d expect, it’s slightly undercosted for its pricetag, giving you a 5000 body as early as turn 4. These will have an immediate chilling effect on the battlefield, as your opponent will have to consider the risk of losing most of their creatures if they go after yours or your shields. Naturally, this plays right to your advantage. While you’ve establishing a defensive perimeter with one hand, the other will be looking to deploy creatures which put you up cards on your opponent, under the classic axiom that more cards equals more options, and the player with the most options wins. A classic example is found in your pair of Aqua Seneschals, three-drop 2000’s which net you a card every time they attack. At worst, this is cycling a card for three mana, since even a suicidal attack replaces it in your hand. If you’re in the position where you can get in with the Seneschal more than once, you’ll just pull that much further ahead of your opponent. In the four-drops, we find another pair of card-advantage options in the Hydro Spy and Fumes. The Hydro Spy is a very feeble body for four mana, a mere 1000. The upside, however, is that you get a free card when you summon it. Thanks to the individual combat system, we’ve noticed, smaller creatures aren’t quite as irrelevant in Kaijudo as they are in Magic. Left alone in a vacuum, a 1/1 needs 20 turns to kill your opponent. In Kaijudo, they only need six. Sure almost anything your opponent has will kill off the Hydro Spy after one attack if they target it, but considering the Tatsurion deck is unable to block you’ll get at least one shot at the shields. The other card here works advantage in the other direction. Rather than putting you up a card when it enters play, Fumes puts your opponent down one. Because the benefit isn’t as guaranteed as drawing a card (for instance, your opponent might have no cards in hand), Fumes is twice as beefy as the Spy. The final options here are at the top of your curve. King Nautilus pulls double duty, acting as one of your massive closers when you’re ready to take command of the game and go on the offensive. But its 5000 body is enhanced with a double-Seneschal effect: whenever the King turns sideways, you’re rewarded with two cards. The other card here is your foil ultra rare, Razorkinder itself. Although smaller in stature- a mere 4000- Razorkinder crushes any untapped creature your opponent controls when it enters the battlefield with its grab and stab ability, providing you with an immediate two-for-one. The rest of the deck’s creatures are straightforward bodies and closers, largely of the vanilla variety. There is, however, a small tribal subtheme here, as we also saw in Tatsurion’s deck with the Raging Goliant and Beast Kin. Here, it’s a five-drop Horrid Stinger buffing its Rot Worm kin, Brain Squirmers and their more expensive sibling the Grave Worm Hatchling. Filling up the remaining creature slots are a trio of five-drop Hydrobot Crabs, with a very relevant 4000 body. Another option worth pointing out is the Skull Cutter. Although this three-drop is puny (1000), its slayer ability functions much like deathtouch. Although not a blocker on its own, this gives the Cutter a strong reactive ability much the same way a Deadly Recluse does. Your opponent must consider whether or not an attack with their best creatures is worth it, since they’ll risk losing it next turn if you attack it with the Cutter. This is just another way to control the flow of battle, which will almost always work to your advantage. The final three creatures are your top-of-curve closers. King Pontias is a 4000 for six mana, but has the added benefit of being unblockable- no great value against the blockerless Tetsurion, but perhaps useful against other players with custom decks. Zagaan, the Bone Knight is a superb value, offering a 7000 body for only six mana- and with double breaker on top of that! Lastly, Gigargon is an eight-mana 9000 which also crushes two shields on a successful attack. If you’ve managed to dictate the pace of play and blunt Tatsurion’s rush, any of these will help close out the game for you. In fitting the Darkness/Water (Black/Blue) nature of the deck, your noncreature support suite is almost entirely removal with just a splash of card draw. A pair of Spy Missions put you up two cards for four mana, but their real joy will come thanks to their shield blast– nothing consoles you over the loss of a shield quite like two free cards! As you’d expect, the removal package here comes in two flavours- bounce and kill. For the former, you get a pair of Ice Blades and a Teleport. The Ice Blades can send anything Level 4 or less back to your opponent’s hand, while Teleport not only has no such level restriction, but it also replaces itself in your hand. The downside, though, is that Teleport has no shield blast ability, unlike the Ice Blades. At five mana, it’s an expensive porposition regardless of how you draw it. For outright kill, you have even more options. A trio of Bone Blades kills an opposing creature, but like the Ice Blade it stops working at Level 4. Death Smoke serves as the Teleport analogue- restrictionless when it comes to target level, but with no shield blast option to reduce its beefy pricetag. It also necessitates that its target be untapped. If you’ve managed to erect some formidable defenses, that’s a problem that should take care of itself. Finally, Terror Pit offers you straight-up, uncomplicated creature kill, taking care of anything on the board regardless of size and whether or not its tapped. The price for this, however, is steep indeed- a full seven mana. On the upside, it has shield blast, so you’ll nick it for free from time to time. Altogether, Razorkinder presents an intriguing foil to what we’ve seen in Tatsurion’s deck, offering a nicely contrasting pair of playstyles. We’ll next want to see how they do on the field of battle, so we’ll be pitting the decks against one another in the customary fashion before delivering a final verdict and score. When will the event deck review be published though? Worry not, mate, it’s coming! Interesting review. As a wannabe game designer/illustrator/comic artist/whatever allows me to talk seriously about dwarves smashing monsters’ faces, I must say I really appreciate the introduction of other games’ reviews on this site. Keep up the good work! It’s funny how they are reusing arts from the older duelmasters cards.